I'ma make it clear, this topic will be an ongoin' series because this has turned out to be one of the deepest research topics I've come across. At first, I wanted to approach the effects of sugar from a health perspective, but I was soon led to the historical significance sugar has had on the enslavement of Afrikan people. So before I can even get into what sugar does to our bodies, I must dive into just how far the greed for this drug has extended... the core nucleus of the Atlantic Slave Trade! "White sugar is sweet, it is delicious, it is good, however, it is a drug!" Due to the mischievous deedz of the european, sugar has been purposely put in the same category as natural sugarz found in cane or beets — it must be noted that we are not speakin' of natural sugar but refined sugar, that is what that white crystal stuff is really called. "Sugar is nothing but a chemical. They take the juice of the cane or beet and refine it to molasses and then they refine it to brown sugar and finally to strange white crystals." (1)A substance used as a medicine in treatment of a disease. (2)A narcotic, which is a drug that dulls the senses. And when you look at this society and the need for YT to keep the masses in check, you can see this substance has proven to be one of their most lethal choice of weaponz. Dr. Afrika speaks of white sugar bein' used as a weapon against the enslavement of Afrikan people. Not only does refined sucrose enslave the internal organz of the body, destabilizing our inner bio-chemical balance and robbing our body of essential vitaminz and mineralz, it literally was one of the reasonz that lead to the enslavement of our Ancestorz! Sugar has an addicting taste and with addiction comes greed. To be clear, natural sugarz found in almondz, chestnuts, walnuts, pistachios, apples, figz, grapes, olives, barley, wheat, rye, millet, cucumberz, melon, carob, mint, onionz, garlic, lentilz, mustard, ginseng, and honey existed as long if not before wo/man; refined sucrose is a 20th century invention. "sometimes it was called 'Indian salt' or 'honey without bees' and imported in small quantities at enormous cost. By 300BC, the Greeks it was used as medicine and by 600AD, in Persia it was seen as a miracle drug in dealing with pestilence. Remember, I'm referring to sugar that is heated, refined and then solidified into sugar cane juice, not the other white powder stripped of all the natural elements." "Roman writer Discorides gave it a new name, saccharum (later called saccharin), describing it as a "sort of concrete honey which is called saccharum found in canes in India and Arabia Felix; it is consistence like salt and brittle between the teeth." At that time, a piece of saccharum was considered a rare and precious miracle drug, heavily in demand in a time of plague and deadly disease (or dis-ease; body imbalance). This term was later changed to 'khanda' — eventually becoming the English word, 'candy', after surviving the further invasionz of the Muslimz with their Latin tongues. After the rise of Islam, sugar became a potent political form of bribery, where all kindz of people would sell their very soulz for it. This is where the greed came in. European invaderz of Kemet (erroneously called egypt) found that their ambassadorz of the Kemetic court were being corrupted by the sugar habit and won over by bribes of costly spices and sugar. "In the land of the Sulta [in Afrika], sugar grows in great quantities and from it the Sultans draw large incomes and taxes. If the Christians could seize these lands, great injury would be inflicted on the Sultan and at the same time Christendom would be wholly supplied from Cyprus." At first it was the Portuguese who were out in front. Henry the Navigator of Portugal explored the West Coast of Afrika searching for fieldz of sugar cane outside Arab dominion. Instead of finding sugar fieldz, he found what he deemed an even greater "thing" to exploit for profit, our Ancestorz! In 1444, this wicked pirate kidnapped 235 Afrikanz from Lagos to Seville where they were sold into slavery. So not only did YT find a the perfect crop to sell for profit in sugar, he found the perfect human able to endure the demanding physical strength needed to cultivate this crop! This was the beginning of the Maangamizi, or Middle Passage. "The sin what's fixed against the white folks...they made the Bible lie." By 1456, the Portuguese had control of the european sugar/slave trade, with Spain not far behind. After the Moorz (who were Afrikan) were ousted out of Spain, they left behind large cane fieldz in Granada and Andalusia. In 1510, after Columbus' second voyage to the New World, he negotiated the transportation of Afrikanz in the West Indies to work on the Spanish sugar cane plantationz. King Ferdinand called for the kidnapping of a large amount of Afrikanz to satisfy this need. By this time, the Portuguese were growing sugar cane with Afrikan slave labor in Brazil. In 1515, Spanish monks offered $500 in gold as loanz to anybody who would start a sugar mill. The Dutch got into the game around 1500. Because they were skillful seamen, they were able to transport a large portion of our Ancestorz. They used our Ancestorz as credit to start their sugar empires in Antwerp, which was shipped from Lisbon, the Canary Islandz Brazil, Spain, and the Barbary Coast, then exported to the Baltic states, Germany, and England. By 1560, Charles V of Spain had built magnificent empires in Madrid and Toledo, Spain off the exploitation of Afrikan free labor. Because of the greed for sugar and Afrikanz, the Portuguese and Spanish empires rose swiftly in power. But sugar had its own planz. With all their illegally-amassed power, these empires rapidly went into decline because as I stated earlier, it is a drug. Sugar is a narcotic that seez no racial prejudice and seeks to destroy anyone who wishes to befriend it. "In the beginning, Queen Elizabeth I shrank from institutionalizing slavery in the British colonies as 'detestable,' something which might 'call down the vengeance of heaven' on her realm." But by 1588, she quickly turned from God-fearing to power-hungry, establishing the 'Company of Royal Adventurers of England' in Afrika, creating for them a huge monopoly in the West Afrikan slave trade. "If we couldn't civilize this white man when we were at our highest, during the Nile Valley days, why we think we can get them to change now?!" This group came to West Afrika exclusively to kidnap Afrikanz, who were then transported to the West Indies sold to sugar planterz. This was mainly done to establish trade with the mistakenly called "Native" Americanz — Afrikanz were in the america's well before the Red man. In fact, some of the earliest Chiefs were dark-melanated beingz looking exactly like their cousinz in Afrika!). What they established from now turning the fermented raw sugar cane juice into rum was, in large part, the ital element to their demise. They gave this rum to the Red man in trade for furz. The furz and sugar went to YT in europe and molasses went to the colonialz in the New World. This triangular trade went on until the land in Barbados and other British stolen islandz were unable to produce anymore crop because the land was exhausted. Dope, I mean, sugar pushing became so profitable by 1660, the British were willing to go to war. They created the Navigation Acts of 1660 claimed the prevention of the transport of sugar, tobacco or any product of the American Colonies to any port outside England, Ireland, and British possessionz. The Colonies wanted to be free to trade with all European powerz. And while American historianz like to argue that it was the British tax on tea that started the War of Independence, otherz point to the Molasses Act of 1733, which levied a heavy tax on sugar and molasses coming from anywhere except the British sugar islandz in the Caribbean. What happened was the ship ownerz of New England had cut themselves in on the rewarding trade of Afrikanz, molasses, and rum. They would sail off with a cargo of rum to the slave coast of Afrika to exchange for kidnapped Afrikanz whom they hauled back to the West Indies for sale to the greedy British plantation pirates. From there they took on a load of molasses which they hauled back home to be distilled into to rum to sell to their heavy drinking wino's. So we can see the enslavement of Afrikanz is rooted in YTs addiction to sugar. This, by no meanz, gives them immunity because of their addiction. The names "drug seller", "drug abuser", "abductor", "kidnapper", "molester", "murderer", and so on, should forever-more be stamped on their headz! "...[W]ant had become need. Gluttony had produced necessity. Sugar and slavery were indivisible. Therefore, they were defended together." The French took the lead in the game in the middle of the 18th century. Sugar was everywhere by now. It had become a source of public wealth and international importance. Each government kept their allegiance to this organized crime by making sure they got their cut through taxes. The ill -ish is just as with tobacco, the soil can be ruined after extensive strain on the land. By the mid-1850s, British sugar planterz in Barbados and Jamaica were ruined. This caused the British government to raise the price of enslaved Afrikanz to cover for the sugar loss. This created an intense, almost exclusive focus on the slave trade. 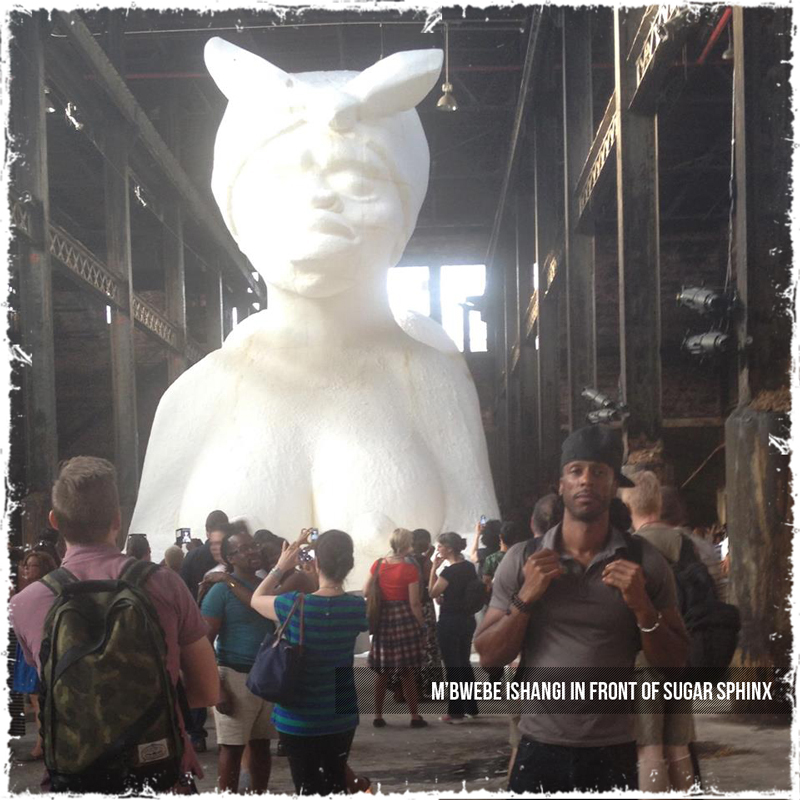 "the slavery of one kind or another never went out of style as far as sugar was concerned. The sugar industry was the model for other agribusiness conglomerates that were to follow decades later. Sugar beets had still to be planted, thinned and topped by hand. Growing sugar cane required backbreaking labor under the hot sun of those climates where the cane thrived. Tending and cutting of sugar cane could not be mechanized. It had to be done by hand. Most of the hands were black." As I started, I wanted to write about the health effects sugar has on our bodies, but as I dug deeper, the Ancestorz willed me to speak of a story seldom, if ever told; to make a connection the masses may not be aware of. It is vital that we overstand that the origin of refined sucrose, that other "white stuff", more addictive than any other drug (including crack-cocaine), has played a significant part in the continued historical, physical, and mental enslavement of Afrikan people worldwide. A role that it still playz today. However, this is not to say if we cured YT from its sugar addiction, they would suddenly become humanitarianz... let's not be naive, Afrikanz (for more info read this). Refined sucrose didn't create itself. Natural sugar probably has been here since the first plants started grow on this planet. It is the wicked, imbalance mindset of europeanz that decided to create this addictive drug. Part 2, we will continue the historical evolution of sucrose and begin to breakdown the effects this crystallized powder has on your body. 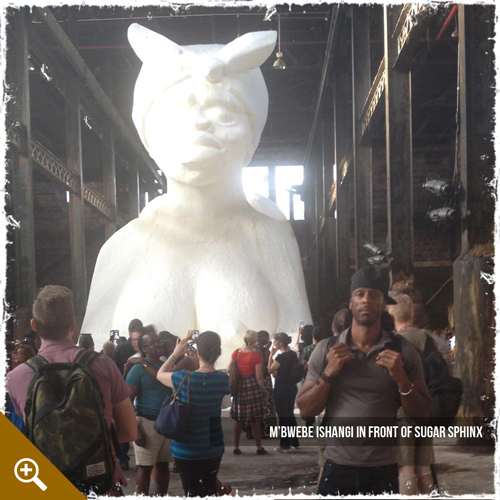 **UPDATE: Summer of 2014, Kara Walker revealed a monumental exhibit called 'A Subtlety: the Marvelous Sugar Baby' that was a massive, sugar-coated sphinx-like woman with very prominent Afrikan features held at the lengedary Domino Sugar Refining Plant bfore it was demolished in Brooklyn, New York. It was, in her wordz, a "homage to the unpaid and overworked Artisans who have refined our Sweet tastes from the cane fields to the Kitchens of the New World." Needless and unfortunate to say, it amassed news and social media frenzy as the mindz of ignorance found it hard to translate the historical facts sugar has had on the world—and Afrikan people in particular who worked the cane fieldz, many to their death. I went to see this sweet yet historically deadly structure and interpreted her choice of molding it in the image of one of the 7 Wonderz of the World, Her Em Akhet (erroneously called the sphinx), as a blatant correlation to both the tragedy and hope of a checkered past that must come to the forefront, addressing the worldz participation in the most likely the greatest atrocity done to wo/man... slavery. Soon after I posted a picture on social media and a cyber debate ensued. Check it out here. Zulute to Sis-Star Kara Walker! • omigoodness. I barely got throughit and I am just like, wow! Thankyou for this! My son and I were actually looking for information on white sugar the other day. • i've been keeping current on sugar cane slavery in the dominican republic (the slaves are haitian) for many years, as i've been studying spanish.... it goes back a long time and it's DEEP and the current issue other than the practice itself is the fact that a few yrs ago, the dominican government began a program akin to what arizona has for "illegal immigrants" now but like 10 times worse bc when you're found without "papers" you're rounded up and booted back across the border. which of course then means basically anybody who's dark skinned is targeted... I WISH more ppl knew abt this.